Most syringes used for injections or to precisely measure oral medication are calibrated in milliliters (mL), also known as cc (cubic centimeters) as this is the standard unit for medication. The most frequently used syringe is the 3 mL syringe, but syringes as small as 0.5 mL and as large as 50 mL are also used. You read the gradations on the side of the syringe for fractions of milliliters, depending on the size of the syringe. Each size syringe -- from the smallest at 3 mL, to syringes between 5 and 12 mL and syringes over 12 mL -- has its own gradations. 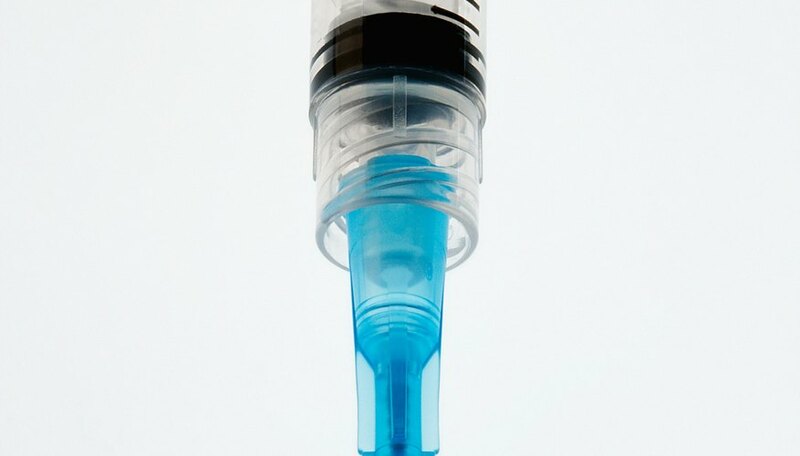 Draw liquid into a 3 mL syringe by inserting either the tip or the needle into the liquid and pulling the plunger upward. Turn the syringe so that the tip or needle points upward and make sure you can read the numbers on the side of the syringe right-side up as you would read numbers on a printed page. Note the number marked on each of the two long lines between which the top ring of the plunger (the ring closer to the tip or needle of the syringe) rests. The last long line closest to the needle or tip is the zero mark. Count the number of short lines from the top ring of the plunger to the nearest whole or half mark (long line) above it. Add 0.1 mL to the number on the whole or half mark for each line you count. Use the following examples as guidelines for Step 3, keeping in mind that you are reading the syringe with the needle end up. If the top ring rests three lines below the top line on the side of the syringe there are 0.3 mL of liquid in the syringe (0 +0.3 = 0.3). If it rests one line below the 2.5 mark, there are 2.6 mL of liquid in the syringe (2.5 + 0.1 = 2.6). If it rests three lines below the 1.5 mark, there are 1.8 mL of liquid in the syringe (1.5 + 0.3 = 1.8). Draw liquid into the syringe by sticking the needle or tip into the liquid and pulling the plunger upward. Turn it so that the needle or tip points upward and the numbers on the side of the syringe appear in proper position. Note how many shorter lines are between the top ring of the plunger and the nearest long line above the top ring when you hold the syringe with the needle end up. Calculate the amount of liquid by counting 0.05 mL for each long line and 0.01 mL for each short line from the zero line at the top of the needle end of the syringe body to the top end of the plunger. Make sure you continue to hold the syringe with the needle end facing upward. Use the following examples: If the top plunger ring rests one large line and two small lines from the top of the syringe body, then there are 0.07 mL of medication in the syringe. Remember that the line closest to the needle is zero, so that if the top ring of the plunger rests two small lines below this line there are 0.02 mL of liquid in the syringe. If the top ring of the plunger rests three large lines and four small lines from the top line of the syringe body, then there are 0.19 mL of liquid inside. Draw liquid into the syringe by inserting either the tip or the needle into the liquid and pulling the plunger upward. Turn the syringe so that the tip or needle points upward and you see the numbers at the side of the syringe in proper position. Note the position of the plunger ring closest to the needle or tip and the number to which it is the closest. Remember that the line closest to the tip itself is the zero line. Add 0.2 mL for every line on which the plunger ring rests below the nearest whole number. Three lines below the "3" mark equal 3.6 mL and one line below the "9" mark equals 9.2 mL. Four lines below the top mark equal 0.8 mL. Draw liquid into the syringe by inserting either the tip or the needle into the liquid and pulling the handle upward. Turn the syringe so that the tip or needle points upward and you see the numbers at the side of the syringe in proper position. Note the numbered line closest to which the plunger ring nearest to the tip of the syringe rests. Add 1 mL for each line below it and above the next numbered line. If the top of the plunger rests three lines down from the line marked "5," then there are 8 mL of liquid in the syringe. If it rests two lines down from the line marked "15," then there are 17 mL of liquid in the syringe. Do not attempt to read insulin syringes using this information. They are not calibrated in milliliters. Consult your doctor for any information regarding your insulin dosage. Disregard any scale marked with numbers such as "30m." That is the older "minim" scale and it is rarely used. DeMerceau, John. "How to Read Measurements on an mL Syringe." Sciencing, https://sciencing.com/how-to-read-measurements-on-an-ml-syringe-12581405.html. 25 October 2017.